In my previous post I wrote about the concept of Generic Modality Compression (GMC) as described in the book Creative Chordal Harmony for Guitar by Mick Goodrick and Tim Miller. The wealth of material in this book may seem overwhelming because for each scale there are 10 combinations of three-part chords, and for each chord there are six voicings (you can read my review of the book if you don't know what I'm talking about). So I thought about a way to practice some useful GMC chord voicings and their combination by concentrating on only three scales and one type of three-part chord in close voicing: I chose the dorian, altered, and the lydian scale, and I only use chords in fourths (called sus4 in the book, which is confusing because in many cases they aren't what we'd usually call a sus4 chord). The chords in fourths I simply chose because I like their sound. And I chose those three scales because they can be used to play II-V-I progressions in a major key. There are also other scales I could have chosen for playing II-V-I progressions, but the other important reason why I chose exactly those scales is the fact that they contain no avoid notes. In the book on GMC the problem of avoid notes is not discussed. In my review I wrote about this issue, so you can read some background information there. Anyway, by choosing chord scales without avoid notes we won't get into trouble. So how did I come up with the II-V-I progressions? First, I wrote down all close GMC voicings (in fourths) for each of the three scales. I chose C major as the key, so we get D dorian, G altered, and C lydian. 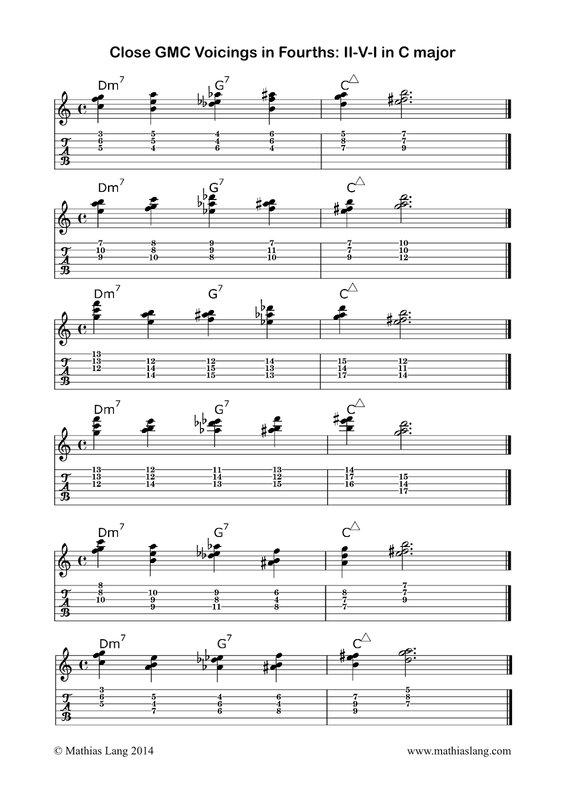 You can find the voicings on the left sheet below. I wrote them out for the string combinations d-g-b and g-b-e. Of course you can choose other strings too, but remember, we wanted to keep things manageable for a start. Then I combined some of the voicings to get II-V-I progressions. There are many combinations, but I wrote down six examples to get you started. You can find these examples on the other sheet below. Enjoy those strange sounds and do something useful with them!